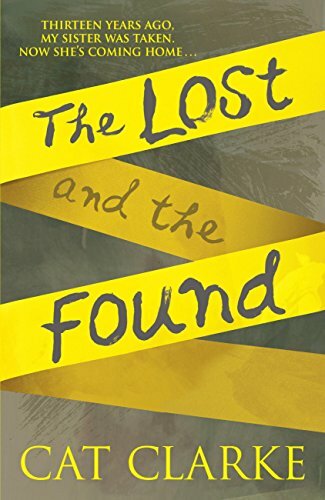 The Lost and the Found by Cat Clarke is a YA psychological thriller. The narrator is Faith Logan, whose sister Laurel was abducted when Faith was four and Laurel was six. The mysterious disappearance of middle-class, photogenic blonde Laurel, with her educated, articulate parents, has become the subject of endless tabloid speculation, awareness campaigns and true-crime paperbacks over the past 13 years. Consequently, the police call to announce that Laurel appears to have been found alive, Faith not only gets her sister back, but also has to handle the constant attentions of the media and the public. Faith isn't comfortable with appearing on day-time TV shows or the family's lucrative book deal, but Laurel seems to be thriving on the attention, and she quickly slots herself into Faith's small friendship group, too. Faith soon starts to find some of Laurel's behaviour a little odd ... has Laurel been damaged by her horrific ordeal at the hands of her abductor, or is there something else she's hiding? Or could it be that Faith is letting a deeply-buried resentment of Laurel's new status as the family's golden child affect her judgement? Ever since reading Vivien Alcock's The Cuckoo Sister when I was around 10, I've been fascinated by stories of siblings who disappear and return. Cat Clarke handles the subject extremely convincingly and in Faith creates an honest, flawed and credible perspective from which to explore an emotionally complex situation. Faith is a believable teenager, which means like that like most teenagers she can be unreasonable and inflexible (her assumption that any woman interested in clothes or makeup must be stupid and shallow is infuriating, as is her reluctance to cut her mother some slack now and again while viewing her father through rose-tinted spectacles). But at heart, she's a thoughtful, well-meaning and likeable narrator with whom it's easy to empathise, whether she's coming to terms with Laurel's return or just realising that her boyfriend Thomas might, in fact, be a tiny bit of a pillock. The supporting characters are also vividly portrayed; Cat Clarke is adept at building a clear picture through just a few well-chosen details. I found The Lost and the Found gripping from start to finish, although interestingly, I also found the bare bones of the plot relatively predictable, so it was more a case of wanting to find out how things would be revealed and by whom, rather than what would happen next. I also found a couple of elements towards the very end of the book slightly anticlimactic, perhaps a tiny bit lazy - but equally, they also prevented the story from descending into melodrama, which it could easily have done but for Cat Clarke's skill at striking the right balance. Although this is a YA book it's just as good a read for an adult; I'd say it's certainly aimed at the older end of the YA market as parts of the story are by necessity quite dark. If you do like the sound of this book and happen to have a Kindle, it's on promotion on Amazon for just 99p at the time of posting.